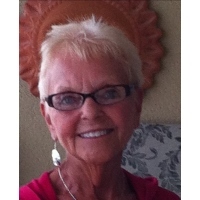 Rebecca "Becky" J. Pryor, 76, of Zanesville passed away at 6:01 A.M. at home, Sunday, January 13, 2019 after a very private & courageous battle with cancer. She was born March 10, 1942 in Carey, OH the daughter of “Jymer” Leon Charles and Marguerite Montague Mullholand. Becky was a member of St. Thomas Catholic Church and retired from Genesis Registration after 25 years of service. She was a wonderful loving mother who was witty and was an avid reader. She loved going to the beach, enjoyed sitting on her deck watching the humming birds and loved sweets. She especially loved spending time with her family and being a surrogate grandmother to three very special children in her life. She is survived by her husband, Jerry Pryor; two children, Patrick Pryor and Andrea (Todd Smith) Pryor Callow; two step-grandsons, Wesley Smith and Wyatt (Linzy) Smith; a step-great granddaughter, Emery Smith; a sister, Margaret Ann "Meg" (William "Bill") Harrison; beloved nieces and nephews; her loving surrogate granddaughter, Haleigh Phillips as well as her very special friend, Julie (Andy) Zigo and their son, Casey. In addition to her parents, Becky was preceded in death by three sisters, Dorothy June Buckingham, Wanda Mullholand and Barbara Dible; two brothers, Charles "Buzzy" Mullholand and Paul Mullholand; and a special surrogate grandson, Aaron Phillips. Visitation will be held from 2:00 PM to 6:00 PM Thursday, January 17, 2019 with Funeral service to follow at 6:00 PM with Fr. Thomas Kumau officiating at the Bryan and Hardwick Funeral Home, 2318 Maple Ave.
Memorial contributions can be made to the Genesis Hospice & Palliative Care. To share memories and condolences with Becky’s family please click on the Guest Book link on this page.